An elephant’s tusks are both a blessing and curse. Blessing because they give a sense of true majesty that rise them above other animals as well and being of use for various tasks. A curse because man’s avarice for ivory has led to the senseless slaughter of hundreds of thousands of the magnificent animals. One of the key differences between African and Asian elephants is the tusks. All African elephants, male and female, have tusks whereas only some Asian males have tusks. 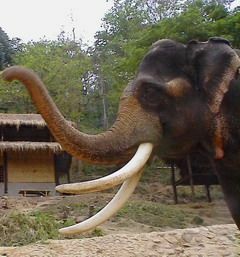 About 50% of Asian females have short tusks known as tushes – which have no pulp inside. 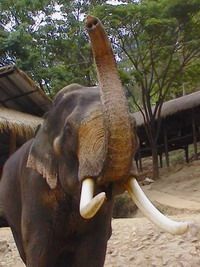 Usually in mammals tusks are enlarged canine teeth, but in elephants they are actually elongated incisors and are essentially no different from other teeth. One third of the tusk is actually hidden from view, embedded deep in the elephant’s head. This part of the tusk is a pulp cavity made up of tissue, blood and nerves. The visible, ivory part of the tusk is made of dentine with an outer layer of enamel. Elephant ivory is unique which when viewed in cross-sections reveals criss-cross lines that form a series of diamond shapes. Elephants tusks never stop growing so some old bulls display enormous examples. However, the average size of tusks has decreased over the past hundred years because hunting elephants for their ivory has resulted in the ‘big tusk gene’ becoming increasingly rare. What are tusks used for? Elephants use their tusks for a variety of tasks. Principally, they are formidable weapons against potential predators like the tiger (although tigers will only ever attack young or juvenile elephants) or in battle against other elephants. They are also used to aid foraging, digging, stripping bark and moving things out of the way; trained logging elephants are capable of lifting large logs with their tusks. There is also a display element to tusks and they can attract the interest of females. Evidence suggests that elephants normally prefer one tusk over the other, similar to being left or right handed in humans. The preferred tusk is known as the master tusk. Ivory poaching for tusks is the main reason that elephants have been so heavily hunted. Elephant ivory has been used in huge amounts to make billiards balls, piano keys, identification chops and many other items for human enjoyment. Although hunting for ivory has been much more severe in Africa, there is no doubt that hunting and poaching has had an effect on the elephant numbers in Asia. In 1989, the Convention on International Trade in Endangered Species (CITES) banned the ivory trade putting hunting outside the law. Poaching does still take place, but in most of the Asian elephants ranges it is under control.